She was England’s answer to Marilyn Monroe, but the glorious Diana Dors soon proved she was her own very unique creature. 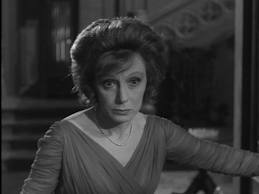 Almost immediately, she lit up a bevy of British noir films and, by the late ‘60s and early ‘70s, was giving honest and heartfelt performances in a variety of horror films including Berserk (with Joan Crawford), the Vincent Price classic Theater of Blood, the anthology From Beyond the Grave and Nothing But the Night (with Peter Cushing and Christopher Lee). Dors was also an accomplished vocalist. Her album Swinging Dors, a fan favorite, features peppy versions of a number of standards, but she also knew how to rock ‘n roll. Her sensuality and common sense were put to great use with the one off single, So Little Time. Courtney Love meets Vincent Price? Count me in! Indeed, The Ball, the upcoming project from the truly colorful and always inventive Count the Clock Productions, promises an aesthetic meeting of these two very creative, yet seeming dissimilar minds (among others). Renowned for such shorts as Pep, I Love Lucy and The Cheerleader Trials, this also promises to be CTCP’s most ambitious project to date. Thus, if you have a pretty penny or two jangling around in those ragged cut-offs, be sure to throw them some help at https://www.indiegogo.com/projects/the-ball-horror#/. There, you can also explore the majestic originality of some of their previous work, as well. Now, with my Good Samaritan cap firmly askew… I wish you SWEET love and pink GRUE, and a wonderful weekend! Its Pride Week here in Chicago and my mind keeps going back to Vincent Price. On a press tour a couple of years ago, his daughter Victoria told reporters that she was certain that this macabre matinee idol had sexual relationships with both men and women. Honestly, it’s not something I really care about one way or other. But anytime an icon of horror is put in proximity with the queer community, there is reason to celebrate. The terror crowd, by and large, is still a very straight and, even more surprisingly, an often right wing one. More than anything, though, it is a silent one. This makes me love Vincent Price even more. Not because of his bedroom proclivities, but because, even in an era when it was much more dangerous to do so, he spoke out. In that (fairly recent) round of press statements, the thing his daughter stressed more than any romantic suppositions was that Price was a true activist for the LGBTQA community. He spoke out against Anita Bryant’s anti-gay platforms in the ‘70s. He joined PFLAG as an honorary member and did an AIDS PSA in the ‘80s. This makes me sad about some of the people I know (and don’t know), though. A few years ago, I was asked to write for a site, but was told that they didn’t do “gay” content. This, in essence, meant that I was supposed to take a straight white perspective when composing for them. What the person who contacted me didn’t realize was that, even with news items and film reviews, he was reacting to them with his own learned insights and background and interests. Of course, that was the style I was supposed to adopt. He thought it was a neutral one. It isn’t. How could it be? He will always react to things the way a straight male would. A Latinx woman will react to them another way. A transgender person, meanwhile, will focus on another aspect of the same story. As will I. That was more about quieting my true voice, though. What concerns me here is that, as rights are threatened more and more by the current powers-that-be, I still have ‘friends’ in fright circles that look at me and tell that they are “fiscally conservative, but socially liberal”. They say they will speak out when the time comes. Instead, I see them sharing news items from Breitbart that mock celebrities for speaking out on social justice issues. Breitbart, by the way, is run by Stephen Bannon, a man who would like to obliterate me (and so many others I know) from the planet. So…thanks! But they are giving a nod to something, at least. There are others who say nothing, at all. Perhaps, they believe human rights are politics and that where one stands on that side of the curtain is a private affair. Maybe they are afraid. Maybe they have become resigned and wearily complacent like me. I couldn’t tell you the last time that I picked up the phone to protest something to some senator or public official. But 40 years ago, Vincent Price, a hero for many of us, wasn’t scared or tentative or let his thoughts grow muted. He got down in the trenches with the underdogs and stood proud. Let’s hope that his truly distinctive voice raised, all those years ago, can bring others out into the open now. Let’s hope it can reawaken mine. We need it. Hopelessly Devoted to: Lynn Bari! With her patrician curls, sophisticated kewpie features and a distinctive, oceanic voice calmed by smoked whisky undertones, Southern bred Lynn Bari (1913-1989) dominated B-movies (and the occasional major feature such as Blood and Sand) from the 1930’s until the early 1960’s. Often cast as a seductress, Bari could play noble just as efficiently, and two of her starring mid-period roles found her tangling with the king of fright, on one hand, and an exotic heartthrob, on the other. Shock. 1946. A young war bride witnesses a psychiatrist’s (played by Lord of the Goth, Vincent Price) crime of passion against his much older wife and in a state of mute horror, soon finds herself trapped at the asylum that he runs. There, Price’s character struggles with his conscience, as he tries to deal with covering up his murderous rampage while simultaneously caring for the welfare of his young victim. Fortunately, (or unfortunately, as the case may truly be) Nurse Elaine Jordan, his lover, played with clipped control by Bari, has no such sympathies and as twists in the case arise, she becomes determined to rid the world of the one person with any knowledge of her paramour’s wrongdoing. 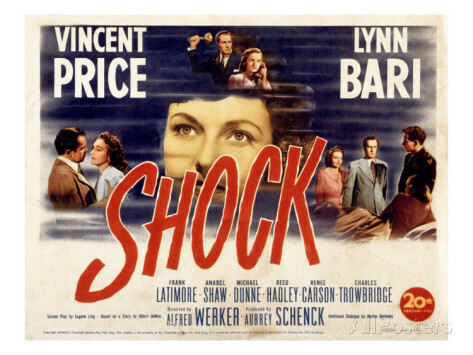 Filmed briskly by director Alfred L. Werker, Shock’s one true moment of camera-action beauty occurs as a frantic Bari runs across the wind tossed estate of the medical facility to Price’s quarters. The buildings and alleyways loom ominously as Bari sprints, majestically, to her destination and there is more tension in this short sequence than in the majority of the film’s other twisted occurrences. Pedestrian, yet fun, Shock’s title, ultimately, refers not only to the young married’s initial response to Price’s act but also to the malevolent death Bari prescribes for her – a slow death by insulin shock poisoning. The Amazing Mr. X. 1948. Here, as regal widow Christine Faber, Bari is the unwitting victim. Walking along a rocky seascape near her house one evening, Faber is surprised by the handsome Mr. X, aka Alexis, (European stud Turhan Bey) whom possesses intimate knowledge of the details of her life. 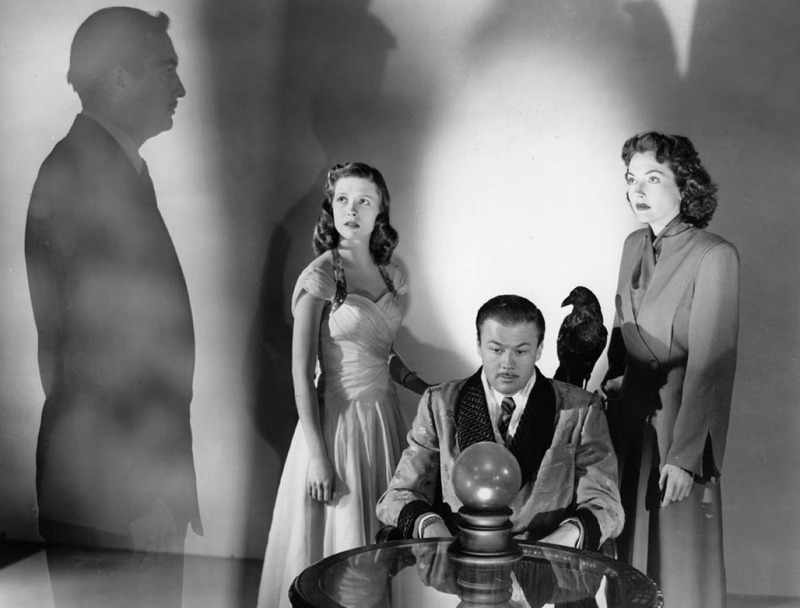 A supposed clairvoyant, Mr. X soon has Faber and her young, live-in sister, wrapped up in his mystical palms. Despite eventual evidence of X’s underhandedness, Faber still goes through with a séance to contact her deceased husband – where things ultimately begin to unravel in a deadly manner. Silkily proud, Bari’s Faber is a strong, yet vulnerable woman and the moody, fog ridden cinematography (masterfully composed by John Alton) not only creates a sense of beautiful tension for the feature itself, but drapes Bari’s elegant features with a misty, haunted precision as well. Containing several outright shocks (especially during the film’s final reel), director Bernard Vorhaus brings out more in the film’s modest budget than would be expected, making The Amazing Mr. X, a step above normal B movie fare – eventually exposing itself as a proud achievement for Bari. While the 30s and 40s were dominated by the villainous portrayals of Bela Lugosi, Boris Karloff, Peter Lorre, Lon Chaney, Jr., Basil Rathbone, John Carradine, Lionel Atwill and others, occasionally a strong female antagonist would peek out from behind the blood stained curtains. While Dracula’s Daughter (1936) and Captive Wild Woman (1944) are prime examples of this, Republic Pictures’ little known Strangers in the Night (1944), released on Blu-Ray by Olive Films in 2013, features both a very strong female lead and a truly disturbing dowager femme at the heart of this shadowy production’s mysterious and deadly doings. Sgt. Johnny Meadows, an injured marine, travels to a small seaside town to meet his female pen pal. Though they have never met, the two have fallen in love and are destined to marry. Of course, Johnny happens to encounter Leslie, the town’s beautiful young doctor, on the train ride in and his attraction to her, coupled with the fact that his never seen sweetheart is mysteriously missing, soon has him switching his affections. Of course, Hilda, his pen pal’s mother, who keeps on insisting her daughter will arrive shortly, is not too happy with this. Seemingly possessed by the enormous living room portrait of her daughter, Hilda eventually succumbs to her darker impulses and it seems, no one, not even her devoted companion Ivy, will escape from her homicidal wraith. As this film whispers with shades of such classics as Rebecca (1940) and Laura (1944), director Anthony Mann and cinematographer Reggie Lanning nicely fill it with moody noir lighting and establish Hilda’s cliff top mansion as a haunting presence unto itself. 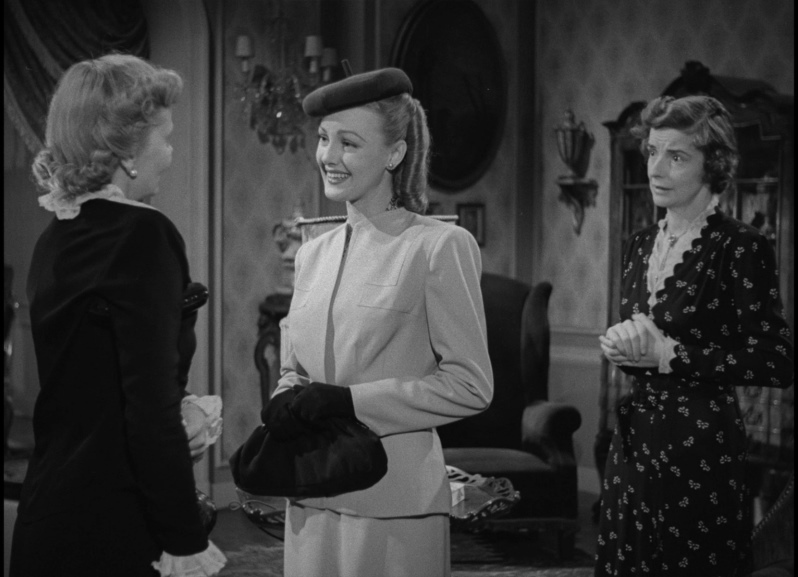 Their work is truly exemplified, though, by the fine portrayals of Virginia Grey, as Leslie, and Helen Thimig, who truly radiates with a glowering sense of madness as Hilda. With simple majesty, Thimig makes this proud woman, crippled both emotionally and physically, one of the most intense presences of those early exploitation years. Granted, the mystery surrounding Hilda’s daughter can only be resolved in a number of ways, yet the trio of writers (Philip MacDonald, Bryant Ford, Paul Gangelin) do surprise those expecting a more deadly offering with their resolution. They, nicely, also give Grey’s Leslie plenty to do. She is both humble, recognizing that her position is rare for the time, and determined in her vocation. While annoyed with Hilda’s interference, she is also exceedingly kind. Grey, brightly, handles all these facets and is particularly poignant when discovering that Johnny is, initially, claimed by another. The lovely Grey, best known to terror freaks for her role opposite cult icon Rondo Hatton in House of Horrors, also, appeared in numerous other cult titles such as Who Killed Doc Robbin and Unknown Island. 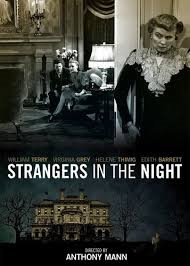 But, Strangers in the Night, also, contains an interesting, round-about connection to horror via the presence of Edith Barrett. Barrett, who brings a leveled humor and hesitancy to the nervous Ivy, was the first wife of the legendary Vincent Price. According to published reports, in real life, Barrett, an esteemed stage actress, was actually a combination of the jittery Ivy and the deluded Hilda, but here she is quietly luminous, rivaling the performances of Grey and Thimig for attention. You can find more about the unique offerings from Olive Films at http://www.olivefilms.com and http://www.facebook.com/olivefilms. Who doesn’t like free? 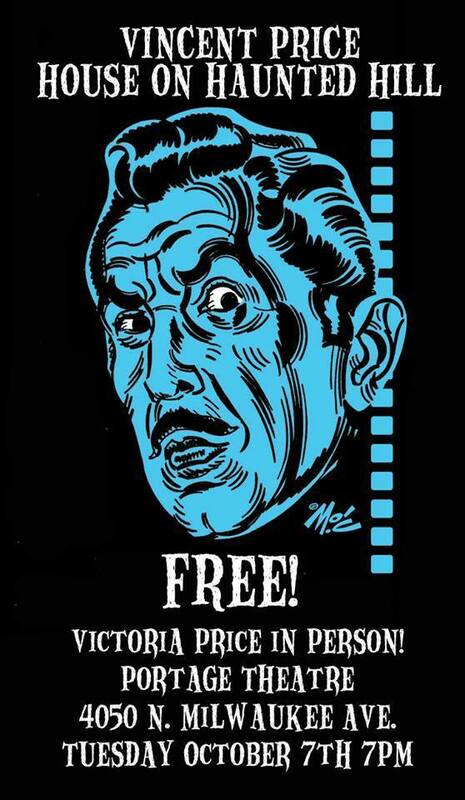 Free, of course, is even better when its something fabulous like a showing of the classic House on Haunted Hill and a lecture on dignified horror king, Vincent Price, no? Proving I’m not leading you on, tomorrow, Tuesday October 7th (2014), author and entrepreneur Victoria Price will be appearing at the Portage Theater in Chicago to lecture on her father (after the showing of the beloved film) – and there is absolutely no charge for the event! Judith Evelyn: The Tingler’s Eternally Regal Victim! At the undead café the greedy zombie hustlers all swirl around Big Gay Horror Fan – until they realize that he has no money to spend. Then, penniless and alone, I make my exit. 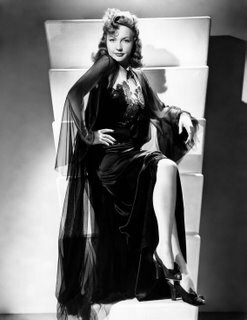 Such grand victimhood was elevated to perfect heights by acclaimed stage actress Judith Evelyn (1913-1967) throughout her cinematic career. But, while this regal dame was often seen as the gaslight ridden heiress or meeting her fate at the hands of some William Castle inspired lunacy, in reality she was one of the few survivors of a torpedoed ship (the Athenia in the Irish Sea in 1939) and in one of her most famous Broadway roles, The Shrike, she played a woman who drove her husband to madness. Well rehearsed Joan and toned Jeff! But in 1955’s Female on the Beach, Evelyn portrayed Eloise Crandall, a victim of an aging gigolo’s (played by toned, silver haired Jeff Chandler) fake love. Dancing between swooning and despondent, Evelyn makes quite an appearance here. Still, this is Joan Crawford’s show. Taking over the house that Crandall was renting, Crawford soon discovers the mysteries behind her seeming suicide. Crawford’s every over-telegraphed reaction is perfect (even after multiple viewings) and the masculine, frequently shirtless Chandler isn’t half bad to look at either. 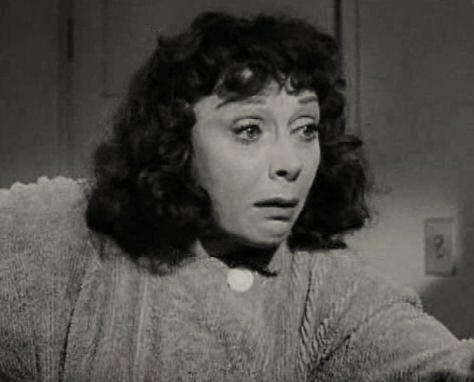 Of course, Evelyn’s most recognizable role to terror teens came in 1959’s The Tingler. Recommended by Vincent Price, whose admiration of her stemmed from a stage production in which both had appeared, Evelyn brings a proud bearing to her mute Martha Higgins. Higgins, of course, meets her fate at the ‘hands’ of the titular Tingler because she cannot scream in fear. The 1961 “What Beckoning Ghost” episode of the Boris Karloff hosted Thriller also ended badly for the consistent Ms. Evelyn. 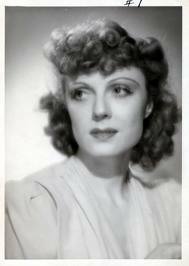 Her Mildred Beaumont is a classical pianist with a bad heart. Ringing with devotion for her husband, Evelyn’s eyes soon rim with petrified despair. Beaumont’s husband and seemingly devoted sister soon drive her out of her mind and into her grave. But, as with most Thriller episodes, their wicked victory is short lived. Evelyn, herself, passed away at 54 from cancer. But avid cine-maniacs can spot her ageless grace and sophisticated delicacy in any home theater from a mile away. Check back frequently as Big Gay Horror (also available at https://facebook.com/biggayhorrorfan) often explores the worlds of femmes of gothic majesty.